FRANKLIN, Wis., Aug. 9th, 2017 – House Speaker, Paul Ryan, focused on workforce development programs during a visit to Allis Roller on August 4th. 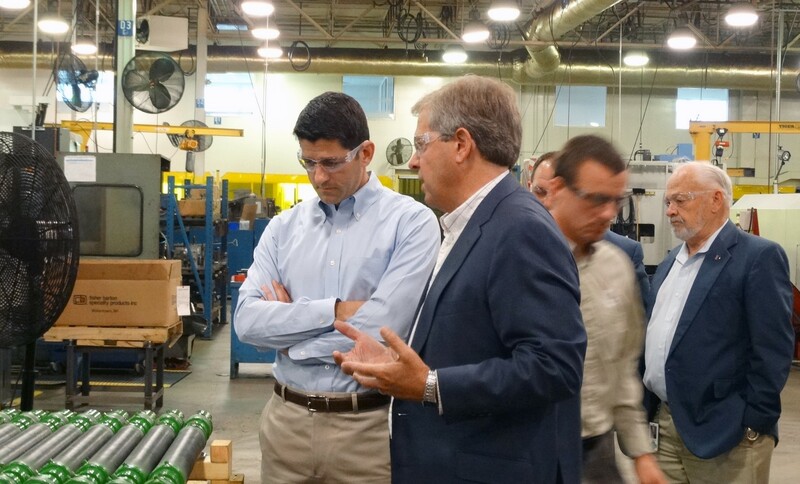 During this visit, Ryan discussed the importance of bringing the government, private sector, and educational programs together to close the skills gap and help people become qualified for future jobs, specifically in the manufacturing industry. Through the Franklin Business Park Consortium, one of the largest industrial parks in Wisconsin, Allis Roller has been able to partner with Milwaukee Area Technical College (MATC) and GPS Educational Partners to get involved with their educational programs. MATC works alongside Allis Roller to allow college students to have onsite experience in a professional manufacturing company while continuing to take classes. In the past two years, MATC has trained hundreds of students at Allis Roller, enhancing the skill sets of new and current employees. Similar to this program, GPS Educational Partners works with high school students and places each student with a local business, ultimately allowing them to build technical skills while also earning their high school diplomas. In addition to Ryan, this event on workforce development was attended by: Senator Dave Craig, Representative Ken Skowronski, Franklin Mayor Steve Olson, and Franklin Business Park Consortium leaders, Rich Simonson (Chief Operating Officer at Carma Laboratories and Treasurer of Franklin Business Park Consortium), and Tom Schulz (Vice President of Manufacturing at Krones and Secretary of the Franklin Business Park Consortium). After a round table discussion with representatives from Allis Roller, MATC, GPS Educational Partners, and other government officials and Franklin business leaders, Paul Ryan took a facility tour then conducted a town hall meeting, fielding questions regarding manufacturing, education, and workforce development in Wisconsin. Allis Roller, LLC is a manufacturer and welder of custom, complex machine parts and rollers of all kinds to the agricultural, construction, and industrial industries. Allis Roller’s engineering expertise enables their team to create precision machine parts for especially unique applications at the highest level of quality, and at globally competitive rates.